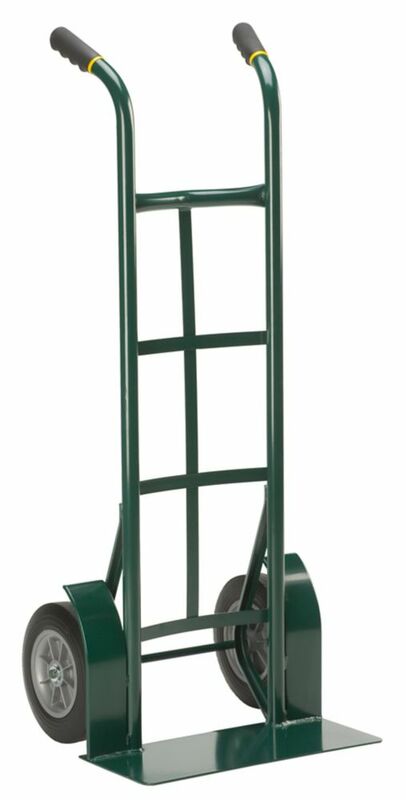 Heavy duty 1000 Pound capacity hand truck easily handles big loads. Large 10 inch Flat-Free wheels that never need air means the truck is maintenance free and always ready for use! Twin comfort grip handles provide optimum operator control with large or bulky items. The Magnacart's Patented Design is the best seller in the industry. Great for traveling, trade shows and small business. The all aluminum frame folds to a compact 2" x 25" footprint for storage but boost a 150 lb load capacity when it's time to move the load. This Harper Appliance Dolly has a Robotically Welded 16 Gauge Tubular Frame. The unit is economically priced yet supports a huge 800 lb load capacity. Equipped with an offset belt tightener with a 2-piece poly belt to firmly secure the load. The non-marking "Snap-on" vinyl facings make this unit the choice for every mover. These rugged, durable dollies are perfect for moving rolls of carpet or sheet goods, equipment, furniture and appliances. Each dolly is adjustable from 24 In. to 33 In. and each holds up to 1000 lb. They are made from heavy, industrial steel, with welded and bolted construction. Heavy-duty, 3 In. ball bearing, non-mar polyurethane wheels enable smooth movement. The 4-inch tri-dolly adds mobility to heavy, bulky items in the basement, garage, or patio. This dolly features tough 1-1/4-inch polyolefin wheels with steel bearings to add support to the frame. This item is part of our move-it home series and has a 150-lb load rating. Super Steel Flat-Free 1000 Pound Capacity Twin Handle Hand Truck Heavy duty 1000 Pound capacity hand truck easily handles big loads. Large 10 inch Flat-Free wheels that never need air means the truck is maintenance free and always ready for use! Twin comfort grip handles provide optimum operator control with large or bulky items. Super Steel Flat-Free 1000 Pound Capacity Twin Handle Hand Truck is rated 4.6 out of 5 by 74. Rated 5 out of 5 by HomeDepotCustomer from Very easy to maneuver . STURDY.... Very easy to maneuver . STURDY. Rated 5 out of 5 by DW1LL from Reasonably priced, good quality and gets the job done. ... Reasonably priced, good quality and gets the job done. Rated 5 out of 5 by johnboy from Very Sturdy. Love that the wheels are protected. Very Sturdy. Love that the wheels are protected. Rated 5 out of 5 by HomeDepotCustomer from made moving a bunch of logs from one place to... made moving a bunch of logs from one place to another real easy. Rated 5 out of 5 by Damon from Sturdy, lightweight, and smooth rolling. Everything needed in a hand... Sturdy, lightweight, and smooth rolling. Everything needed in a hand truck. Having a 1000lb capacity is an added bonus. I will be back for more of these. Rated 4 out of 5 by Tom from Well built. Should last for years. Best part is, I... Well built. Should last for years. Best part is, I do not have to air up tires.